Microsoft has used its highly anticipated Windows 10 devices event to unveil three new Lumia Windows 10 Mobile smartphones. As part of that introduction, the company has introduced two new flagship devices, the Lumia 950 and Lumia 950 XL, as well as a more budget orientated smartphone that is the Lumia 550. All three devices are the first smartphones from Microsoft to run Windows 10 Mobile. Let’s get right into the hardware. 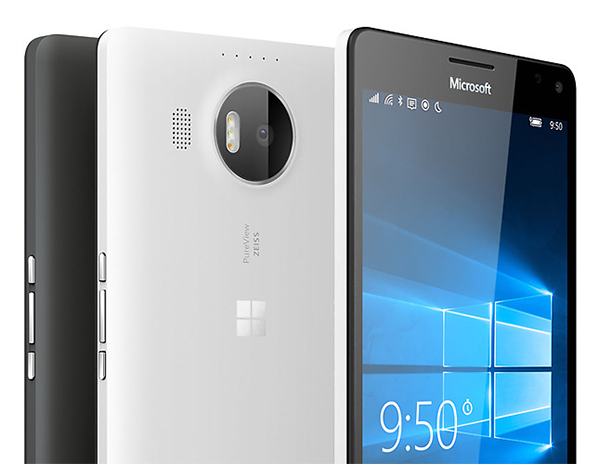 We may have seen a number of leaks over the last few months regarding the Lumia 950, but it’s now officially here. Microsoft’s new flagship is the device that the company is pinning its hopes on for the the future successes of Windows 10 in the mobile space. The gorgeous 950 ships in either a white or black polycarbonate finish, and comes with a gorgeous 5.2-inch WQHD OLED display offering up a 1440×2560 pixel resolution. That display is powered by a Qualcomm Snapdragon 808, 64-bit hexa-core processor clocked at 1.8GHz under-the-hood. Microsoft has thrown in a beefy yet replaceable battery as well which comes in at 3000mAh. In terms of memory and internal storage, the Lumia 950 comes complete with 3GB of RAM and offer 32GB of internal storage, expandable via microSD slot. Photography fans can expect to be able to interact with a 20MP PureView rear shooter with triple LED flash, 4K video recording, and integrated optical image stabilization (OIS). There’s also a 5 MP wide-angle front facing camera for video calling and expert selfies. Qi standard wireless charging, the inclusion of USB Type-C, a built-in iris scanner for use with Windows Hello, and “Liquid cooling” complete what is a great effort by Microsoft. And you thought that’s all? Say hello to Microsoft Continuum which allows users to connect their 950 or 950 XL phones to the Microsoft Display Dock and use it with an external monitor with the interface being Windows 10 like. 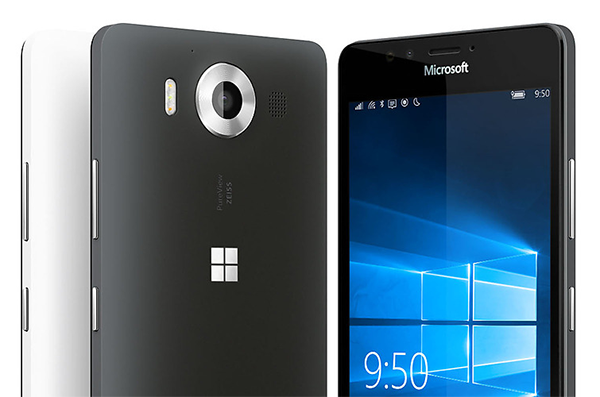 The Lumia 950 XL flagship has some striking similarities to its smaller brother. The hardware ships with the same white or black matte polycarbonate exterior options, but this time with a jumbo-sized 5.7-inch WQHD OLED display with the same 1440×2560 pixel resolution. The 950 XL packs a more powerful punch compared to the 950 when it comes to performance. There’s a Qualcomm Snapdragon 810, 64-bit octa-core processor clocked at 2.0GHz. Accompanying the monster CPU is 3GB of RAM and like the Lumia 950, the XL variant also comes equipped with an iris scanner for Windows Hello compatibility. The same camera setup is present on the XL version, serving up a 20MP PureView rear shooter with triple LED flash and optical image stabilization (OIS). There’s also the same 5 MP wide-angle forward facing camera mounted at the top of the hardware. QI wireless charging and USB Type-C support finish of the specification. The 950 XL also carries the “Liquid cooling” tech like its sibling and supports Windows Continuum. And now onto the Lumia 550. The newly announced budget device that Microsoft is hoping will bring the Windows 10 Mobile experiences to emerging markets and those who really don’t have the financial resources to spend big. The 5-inch smartphone is intended to replace the current Lumia 640 and 640 XL as the company’s budget option. It features a quad-core Snapdragon 210 CPU clocked at 1.1GHz. There’s a 5MP primary camera for those looking to snap some stunning images. Internal storage options starts at the lower-end with 8GB. The specification of the Lumia 550 may not be as impressive as the flagship devices announced today, but the cost of the hardware will likely add more numbers to the 110 million devices that are already running Windows 10. It’s sure to be a popular option in developing countries and across the United States and Europe with those cost conscious consumers. 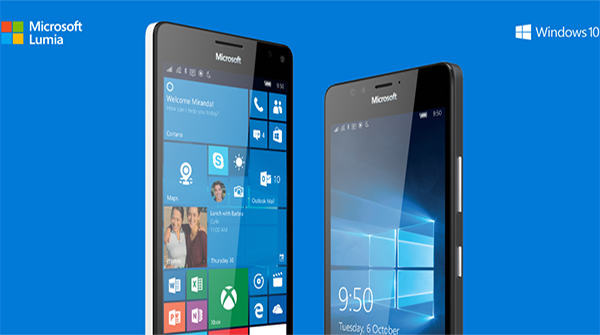 The Lumia 950 and 950 XL will be available for $549 and $649 respectively, with the Lumia 550 starting at $139. Both flagship devices will start shipping in November with the budget 550 becoming available a month later in December in the European markets.